In between our corporate and broadcast commissions we do, occasionally, make and finance our own films. However, when I began my filmmaking career, one of the first pieces of advice I received was “Never make films with your own money”. Back in the day, this made good sense, because everything was shot on Eastmancolor negative stock at eye-watering expense: ten minutes of 16mm film, processed and printed, cost about two hundred UK pounds. Now with digital video recorded on memory cards, the situation has changed beyond recognition, for if you have the equipment, the only major outgoings are travel and subsistence, apart from the huge amounts of our own time and skills. 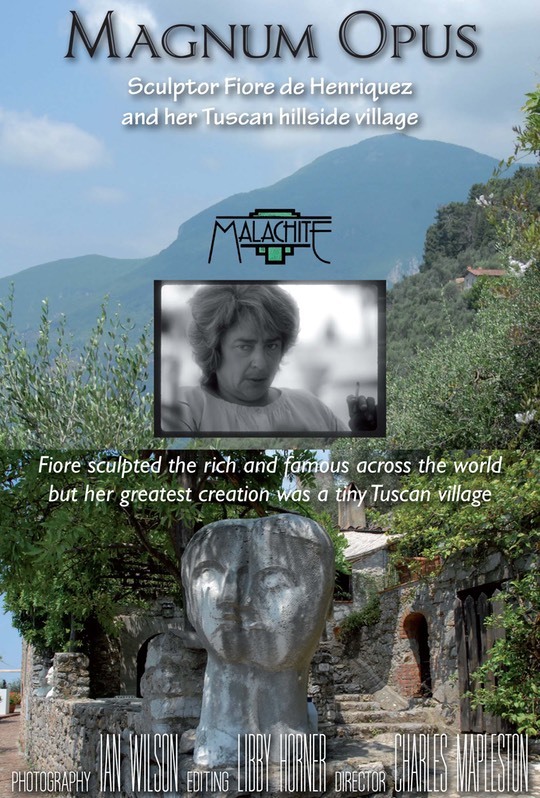 Back in the days of shooting on 16mm film, and In spite of advice not to make films with my own money, some subjects I found irresistible, including the sculptor Fiore de Henriquez who was rebuilding an Etruscan village ruin on the side of a mountain in Tuscany. I persuaded my good friend and noted cinematographer Ian Wilson BSC to come along for the ride, and we began filming in Rome and Tuscany in 1975, and completed the shooting back in Tuscany in 1978, having in between also filmed in New York, London and Leicestershire. For financial reasons the shoot took three years: whenever we made a little money from a corporate production, we would film a bit more of our own production. However, this extended timescale had several creative benefits as Fiore’s sculpture, village and friendships developed and evolved over time. Although we made a rough cut on film around 1979-80, we were never able to afford the huge ‘above the line’ costs of negative cutting, grading, show-printing and dubbing on film, so in the corner the cans of negative sat until, with the digital editing revolution - and much scrimping and saving - we were finally able to get the negative telecined to HDCAM high definition tape, along with an SD tape for our own digital edit suite. Even then, it has taken several more years to find the time to make a comprehensive new edit of our material, with major input from Libby Horner, who transcribed many hours of interviews and meticulously selected and assembled them along with the visuals into a beautifully structured narrative. Only now, some forty years from our initial cinematography, do we have a completed edit, running at 92 minutes. Magnum Opus - The Trailer from Charles Mapleston on Vimeo .